Cool early but warm later. Sunny all day. Breakfast: Toast and peanut butter. I slept well and, having decided there was no rush to leave early after a long day yesterday and a short day in prospect, had set the alarm for 7am. I managed to set off the smoke alarm while toasting my now mould-free bread but it didn't seem to attract any attention and I knocked the alarm off the ceiling with my trekking pole and removed the battery (all replaced before I left). I departed the Tavern around 8:30am, having to climb over a wire fence to get out because the entrance gate had been locked. The roofers were at work (they were from Albury, my final destination, and were driving back this afternoon to spend the weekend at home.....they suggested last night that I jump in the back of their ute (pickup) and give the walking a miss), but none of the tavern personnel were about. It was yet another beautiful morning and I'm starting to suspect I'm going to pay a price for all of this good weather later in the trip. I retraced my steps through the hamlet of Wee Jasper and followed a H&H sign that directed me past the town dump where a couple of guys were at work. They were the last people I saw all day, apart from a couple of cars in the distance on a road I crossed. Once past the dump I began the climb to a ridge in the Wee Jasper Nature Reserve that was described in the trail guide as hard, but I didn't find it too bad. It was just a steady climb on a dusty, and occasionally rocky, foot trail in the cool morning air with the sun shining on my back (not that I could feel it because of my pack). The forest was eucalypt and scrubby bushes (sclerophyll) and pleasing to the eye, but very dry. The ridge provided good views back to the Goodradigbee Valley I had hiked along yesterday and Wee Jasper and, in the other direction, the forested peak of Mt Wee Jasper (1121m) that I would shortly be climbing. At the highest point on the ridge, where I had good mobile phone coverage, I took an early break to check my email and post my diary. The air was still and the temperature just right. It would have been easy to stretch out and read a book or have a nap. However, even though I had a short distance for the day, I knew I would be slow because of the steady climbs and descents and couldn't afford to loiter for too long. 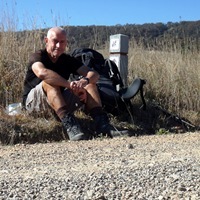 I descended along the foot trail to the next valley which was farmland at its base and followed the H&H markers across some fields, over a minor road, and then up the lower slopes of Mt Wee Jasper. The climb was steady, slow and sweaty as the day warmed, but not too bad. At the lower elevations it was scrubby and dry eucalypt forest again, but higher up the forest became greener, the undergrowth primarily ferns, and the trail often grassy as it climbed through the higher sub-alpine valleys. Eventually I reached the summit of Mt Wee Jasper, but was disappointed to find that the forest obscured most of the views. There were a couple of benches there and I sat and had my lunch in the grassy clearing. Soon I was joined by a dark-coloured wallaby with a joey that occasionally stuck its head out of her pouch and sampled the vegetation. I was surprised how unafraid it seemed because there would have been few visitors to this peak. I checked the log book there and hikers only came through every week or so. Anyway, it was nice to sit and eat and observe the wallaby hopping around and grazing just a couple of metres away. After lunch, the trail descended steadily through a mix of silent eucalypt forest and pine plantations and around 3:30pm I reached the Log Bridge Creek Campsite in a narrow valley and quickly set up camp. By 4pm the sun had gone and the temperature dropped quickly. The adjacent stream has very cold and slightly murky water, though it should be fine to drink at this elevation. I washed myself and some clothes and updated my diary before eating dinner. I toyed with the idea of lighting a fire, but in the end couldn't be bothered. It's very cosy in my sleeping bag and I'll head there after dinner and listen to the Geelong vs Essendon AFL game on my radio.